Brand new heavy metal festival HEAVY SCOTLAND is delighted to announce its first wave of bands for its debut year, to be held in Edinburgh between the 1st-2nd April 2017. 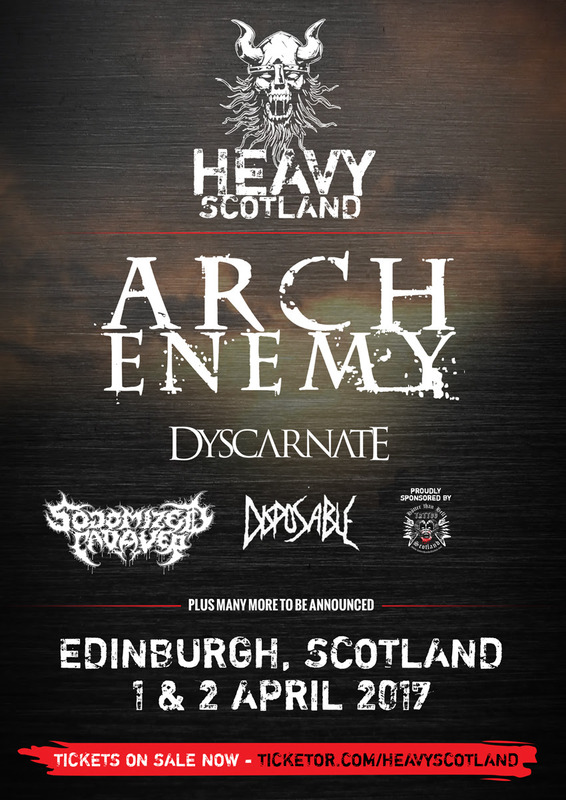 Announced already are the first headliners, melodic death metal legends Arch Enemy; plus acclaimed brutal death metal band Sodomized Cadaver; resurgent death metal favourites Dyscarnate and Scottish thrashers Disposable. Plenty more huge bands to come so stay tuned. This entry was posted on 26th August 2016 at 10:45 am and is filed under News with tags 1st edition, Edinburgh, Festival, Heavy Scotland, Metal, Scotland. You can follow any responses to this entry through the RSS 2.0 feed. You can leave a response, or trackback from your own site.